Next time you’re renovating and need to run some cables around corners in you walls, save yourself some frustration by building [izzy swan]’s corner drilling rig. It’s something akin to a custom tunnel boring machine but on a small scale. Starting with a piece of steel, [izzy] traced and cut out a 90 degree curve with an attached arm that will allow it to rotate from a central block. He then grabs a random drill bit and attaches it to a flex shaft which is secured to the leading point of the steel curve. To complete the handy setup the entire rig is bolted to a block that will clamp over the corner stock. As it stands, it takes some elbow grease to get the drill through, but it’s not a purpose built setup. On a second demonstration, the flex shaft breaks, but the idea is there. Now, [izzy] advises that this is most easily accomplished when re-framing walls with no drywall obstructing your drill, but the concept for this rig could nonetheless prove handy for welding, grinding, and so forth along any angled curve. If instead you want to push your carpentry skills to their limits, build a wooden Vespa. [Dorkyducks] is a bit of a jeweler, a bit of a carpenter, and a bit of a hacker. They’ve taken some time to document their technique for making bentwood rings. Bentwood is technique of wetting or steaming wood, then bending or forming it into new shapes. While the technique is centuries old, this version gets a bit of help from a modern heat source: The microwave oven. [Dorkyducks] starts with strips of veneer, either 1/36″ or 1/42″ thick. The veneer is cut into strips 1/2″ wide by about 12″ long, wrapped in a wet paper towel, and microwaved. The microwave heats the water in the towel, steaming it into the wood. This softens the wood fibers, making the entire strip flexible. The softened wood is then wrapped around a wooden preform dowel and allowed to dry for a day or two. Once dry, the wood will hold the circular shape of the dowel. [Dorkyducks] then uses masking tape to tack the wood down to a new dowel which is the proper ring size for the wearer. Then it’s a superglue and wrapping game. The glue holds the laminated veneer together, and gives the ring it’s strength. From there it’s sanding, sanding, sanding. At this point, the ring can be shaped, and inlays added. [Dorkyducks] shows how to carve a ring and insert a gemstone in this gallery. The final finish is beeswax and walnut oil, though we’d probably go for something a bit longer lasting – like polyurethane. [Bob’s] Pac-Man clock is sure to appeal to the retro geek inside of us all. With a tiny display for the time, it’s clear that this project is more about the art piece than it is about keeping the time. Pac-Man periodically opens and closes his mouth at random intervals. The EL wire adds a nice glowing touch as well. The project runs off of a Teensy 2.0. It’s a small and inexpensive microcontroller that’s compatible with Arduino. The Teensy uses an external real-time clock module to keep accurate time. It also connects to a seven segment display board via Serial. This kept the wiring simple and made the display easy to mount. The last major component is the servo. It’s just a standard servo, mounted to a customized 3D printed mounting bracket. When the servo rotates in one direction the mouth opens, and visa versa. The frame is also outlined with blue EL wire, giving that classic Pac-Man look a little something extra. The physical clock itself is made almost entirely from wood. [Bob] is clearly a skilled wood worker as evidenced in the build video below. The Pac-Man and ghosts are all cut on a scroll saw, although [Bob] mentions that he would have 3D printed them if his printer was large enough. Many of the components are hot glued together. The electronics are also hot glued in place. This is often a convenient mounting solution because it’s relatively strong but only semi-permanent. A few years ago, the world of fine woodworking was presented with the Fletcher Capstan table. It’s a round table, able to expand its diameter merely by rotating the top. A gloriously engineered bit of mechanics move the leaves of the tables out while simultaneously raising the inner part of the table. It’s a seriously cool table, very expensive, and something that will probably be found in museums 100 years from now. 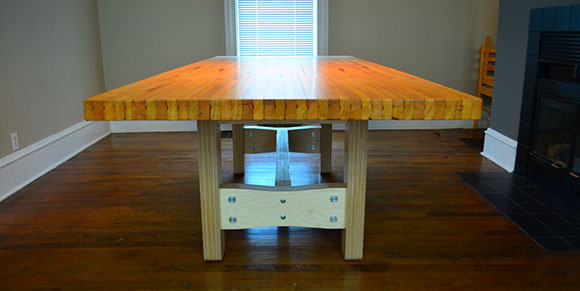 [Scott Rumschlag] thought his woodworking skills were up to the task of creating one of these expanding tables and managed to build one in his workshop. Like the Fletcher Capstan table, it’s a table that increases its diameter simply by rotating the table top. Unlike the commercial offering, this one doesn’t cost as much as a car, and you can actually see the internal mechanism inside this table. The top of [Scott]’s table is made of three pieces. The quarter-circle pieces are the only thing showing when the table is in its minimum position, and are arranged on the top of the ‘leaf stack’. When the table expands, four additional leaves move up from beneath with the help of a linear bearing made of wood and a roller that slides along the base of this mechanical contraption. The center of the table – the star – is a bit more difficult to design. While the leaves move up the stack of table tops with the help of a ramp, this is an impractical solution for something so close to the center of the table. Instead of a ramp, [Scott] is using a lifting lever and metal hinge that brings the star of the table up to the right level. Even though it’s a crazy amount of woodworking and fine tuning to get everything right, it’s not too terribly difficult to get your head around. Videos, including one of the assembly of the table, below. For a workbench, desk, or even a dining room table, there’s nothing quite like a massive piece of laminated maple put to use as the surface of a table. Whether in the form of butcher block, a shop class table, or in [Dillon]’s case, a reclaimed bowling lane, laminated maple provides one of the best possible table surfaces. A while back, [Dillon] found someone on Craigslist willing to part with an eight foot section of a bowling alley for about $300. After trucking this two and a half inch thick, 250 pound monstrosity home, work began on converting it to a dining room table. Bowling alleys are constructed by workers laying down maple strips and nailing them together one row at a time. This provides a stable surface when mounted on a concrete platform, but is completely insufficient for a table. To keep his bowling alley table from sagging, [Dillon] routed out three slots for aluminum bars going across the width of the lane. These bars were then screwed into each individual maple strip in the lane, resulting in a very sturdy surface. The strengthened lane was then resurfaced with the help of a huge industrial belt sander and finished with a satin polyurethane. The legs of the table are made out of CNC’d 18mm Baltic birch plywood held together with metal fasteners. The end result is a beautiful table ready to last 100 years. Considering [Dillon] spent less than $1000 on this table – and the price of eight feet of 2.5″ butcher block – we’re going to call this a win for [Dillon], his kids, and grandkids.